Enjoy “who-dun-it?” mysteries? If so you have good company. Two of the longer running TV shows, CSI: Crime Scene Investigation and Forensic Files are who-dun-its. Adding to these shows’ intrigues are the fascinating forensic detection techniques that are used to uncover evidence crucial in solving the presented cases. If only investors had similar forensic tools that could shine the light on economics! Instead, confusion reigns far and wide. Are we stuck in a secular stagnation due to insufficient demand as some influential economists tell us? Is their prescription for economic “pump priming” of still more government borrowing to fuel infrastructure spending the answer? Have all the important things already been invented as some claim? Are the negative- interest-rate experiments underway overseas the ticket out of slow growth lane? Journalist Joe Klein wrote that our “nation of dodos” is “too dumb to thrive,” and Thomas Friedman repeatedly points to Chinese authoritarianism as a model of efficient policymaking for the new century. Other voices question whether economic growth is all that important and desirable in the first place. Are they right? Is Chinese authoritarianism the new model of efficient economic policymaking as some popular pundits claim? In recent years several important investigations of economic history have arrived on the scene. Collectively, these examinations represent forensic files of sorts as they address fundamental economic issues such as why economies grow and why they don’t. We have discussed some of this research on prior occasions. But against the backdrop of prevailing economic confusion, a review of the insights that can be gleaned from the most amazing, and yet under-told, stories in economics seems warranted. Books by economic historians, McCloskey, Phelps, Hubbard/Kane and Mokyr essentially ask the ultimate “what-dun-it?” question in economics.1 Why did growth in economic well-being (i.e. living standards), which made little progress for eons, suddenly take off like a rocket roughly 250 years ago? 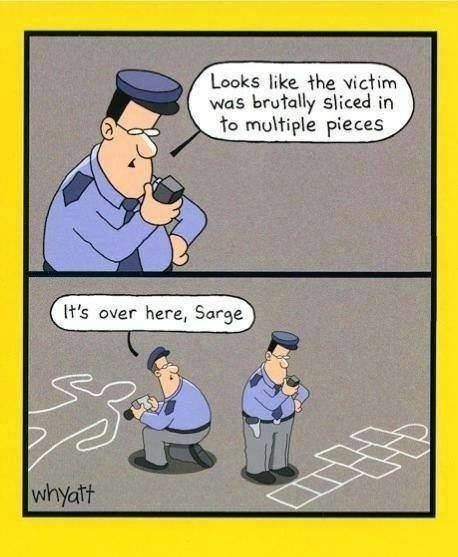 Granted, unlike crime scene forensic science where only a trace of DNA can solve a mystery, causal factors in economics are much messier to discern. This is particularly true when the economy is such a dynamic and adaptive system as has been the case over the past 250 years. The growth in living standards cannot be accounted for by increases in measured physical inputs like capital and labor only. Instead, other “things” triggered the growth. Chief among these other factors were property rights, rule of law, an independent judiciary, and cultural values that emphasized economic freedom and granted dignity to ordinary citizens engaged in commerce. This confluence of factors unleashed human ingenuity in the search of solutions to problems in everyday life unlike any previous period in time. ”“Nations unaware of how their prosperity is generated may take steps that cost them much of their prosperity. The unleashed ingenuity ushered in furious innovation that drove productivity advances across wide swaths of the economy. One didn’t need to be from nobility, be a straight-A student, or be anointed by the upper crust to innovate. McCloskey suggests that the term innovationism is much more descriptive of the underlying economic forces at work than is the term capitalism. Interestingly, while science played an important role in much innovation, often scientific understanding of why something worked only came after innovation. Examples include the steam engine/thermodynamics, and the Wright Brothers/aerospace. Innovationism occurred in countries with “institutions” (government) that were generally supportive despite the threat to the status quo that it typically creates. The standard of living was lifted dramatically via a “double play process”. First, wages moved higher along with productivity growth. Second, innovation made available to most everyone new and affordable goods and services on an unprecedented scale. To paraphrase Warren Buffett: ordinary Americans could live better than John D. Rockefeller—the “richest” person in history—ever did. The percentage of an average household’s budget devoted to food declined from nearly 50% in the early 1900s to a little over 10% in recent years, according to the Bureau of Labor Statistics. If that percentage had not declined the average household today would spend more than $2,000 a month on food. In 1930 Americans spent more than 8% of their disposable income on energy, according to the Bureau of Economic Analysis. During the 1980s oil spike it peaked at almost 10%. Today it’s less than 4%, an all-time low. The decline in energy spending as a share of income since 1950 means the average household can spend over $1,700 on other goods and services each year that used to go toward energy. While pundits repeat the chant that middle class wages have not grown much since Reagan was first elected President, median compensation—which includes things like health insurance subsidies and company 401(k) matches—is up significantly in inflation-adjusted terms since 1980. People are getting raises, but part of the increases is coming in the form of non-wage benefits. ”“The expanding ideology of liberty and dignity has inspired proliferating betterment by and for the common people. This period of mass flourishing or constant betterment as Phelps and McCloskey respectively call it, hardly represents the exploitation of workers that Karl Marx feared. 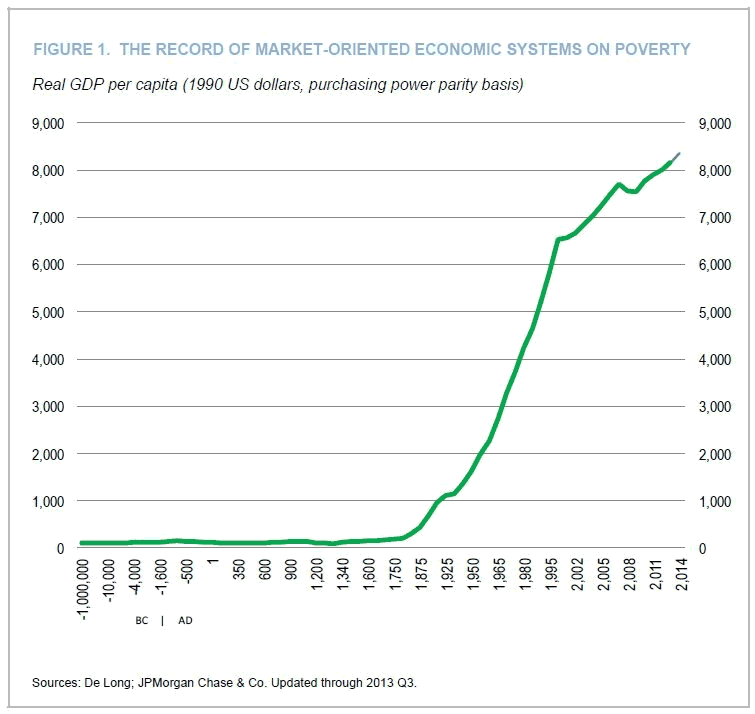 And as Figure 2 below suggests, as economic freedom and the fruits of innovationism have gone global, billions are being lifted from abject poverty. ”“Is economic growth important? 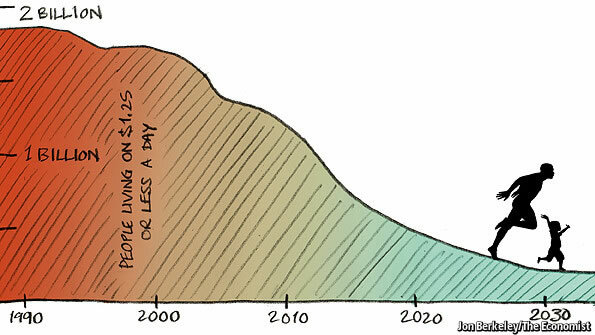 If the economy grows at 2 percent, it will double in about 36 years. If it grows at 3 percent, it will double in 24 years. Tax revenues are a function of economic growth. A double for the U.S. economy would potentially go a long way towards defusing many of the long-run fiscal imbalances the country faces. Phelps noted the importance of “culture” and “values” as support mechanisms for innovationism. Hubbard and Kane’s book, Balance: The Economics of Great Powers from Ancient Rome to Modern America, noted earlier, offers some additional perspective on this important but overlooked topic. “The economic decline is the consequence of stagnant institutions, primarily a political system biased into status quo inaction.” When the political system (government) inhibits innovationism, not surprisingly, you get less of it. Why might Governments become “Biased into Inaction”? First, innovationism brings creative destruction forces to bear on economies. The new creative innovation disrupts the status quo. Some are economically hurt by the change. Most adapt but some never recover. The destruction side of the creative/destruction process is often readily apparent. The disrupted and those threatened by potential change often seek to inhibit it by political means. It was easy to see the shuttered buggy whip factory for example. The benefits of the creative side of the equation, however, are only apparent over time. The second reason countries may become hostile to innovationism may best be described by the term, helicopter government. We’ve all heard about (or witnessed firsthand) helicopter parents. Hubbard and Kane explain the same thing can happen within an economy and a country’s culture. Many would agree that a safety net of government assistance is appropriate to help those “down on their luck”. However, just as it’s a slippery slope between judicious parenting and helicopter parents, so it is for government’s intervention in the economy. Like the Great Depression before it, the Financial Panic of 2008 impacted the nation’s psyche. Fearing a repeat coupled with a “never again” desire of the helicopter government, risk aversion has become pervasive. “Regulation is strangling business investment, and especially the formation of new businesses. But the main problem with regulation is how it’s done, not how much. If we fix regulation, the quantity will take care of itself. Regulation is too discretionary—you can’t read the rules and know what to do, you have to ask for permission granted on regulators’ whim. No wonder that the revolving door revolves faster and faster, oiled by more and more money. Regulatory decisions take forever. Just deciding on the Keystone Pipeline or California’s high speed train—I pick examples from left and right on purpose—takes longer than it did to build the transcontinental railroad in the 1860s by hand. Most dangerous of all, regulation and associated legal action are becoming more politicized. Each week brings a new scandal. Last week, we learned how the Government shut down ITT tech, but not the well-connected Laureate International. The IRS still targets conservative groups. The week before, we learned how the company that makes Epi-pens, headed by the daughter of a Senator, got the FDA to block its competitors, Congress to mandate its products, and jacked up the price of an item that costs a few bucks to $600. This is a bi-partisan danger. America works because you can lose an election, support an unpopular cause, speak out against a policy you disagree with, and this will not bring down the attentions of the IRS, the EPA, the NLRB, the SEC, the CFPB, the DOJ, the FDA, the FTC, the Department of Education, and so forth, who can swiftly put you out of business even if eventually you are proven innocent, or just slow-roll your requests for permissions until you run out of money. Insist on strict timelines—if an agency takes more than a year to rule on a request, it’s granted. (I later learned that this is called a “shot check” in Washington, a nice metaphor). This freedom does not exist in much of the world. The Administrative state is an excellent tool for cementing power. But when people can’t afford to lose an election, countries come unglued. Do not let this happen in the U.S.
Congress can take back its control of the regulatory process. Write no more thousand-page bills with vague authorizations. Fight back hard when agencies exceed their authorization. Insist on objective and retrospective cost benefit analysis. Put in rule-of-law protections, including discovery of how agencies make decisions. Health care and finance are the two biggest new regulatory headaches. The ACA and Dodd-Frank aren’t working and, more importantly, are drags on employment and economic growth. Simple workable alternatives exist. Implement them. The real health care problem is not how we pay for health care, but the many restrictions on its supply and competition. If hospitals were as competitive as airlines, they would work darn hard to heal us at much lower—and disclosed!—prices. Pervasive risk aversion and helicopter governing have, in our estimation, thrown sand in the gears of innovationism. Economic growth is slower than it could be. Perhaps the election will usher in an era where helicopter government policy assumes a “lighter touch” when it comes to intervention in the economy. Perhaps not. Cloud computing, software as a service, internet of things, 3-D printing, software simulation, AI, material sciences, biotech drugs, nanotech, quantum computing, an unprecedented ability to tap into knowledge networks, collaborate and mingle ideas are not just pushing at the technological frontier but likely extending it to new levels. Discovering new solutions to human problems takes lots of trial and error experiments. Every day legions of people apply themselves towards making a better life as part of the what-dun-it? process. They have incredibly powerful tools to pair with ingenuity to solve problems—the ingredients for what-dun-it? remain in place. Innovations are hardly ever obvious before the fact. For if they were, the innovative solution would have already been discovered. The future is always hard, problems always exist. But with problems come potential solutions…and within those solutions are investment opportunities. Appendix: Japan and Europe, who-dun-it? In their book, Balance: The Economics of Great Powers from Ancient Rome to Modern America, Hubbard and Kane also offer some interesting insight about the Japanese and European economies. They suggest that countries that did not previously participate in innovationism have available catch up growth options. Take the auto industry as an example. In the late 1960s U.S. manufacturers had dominate market share but knowledge of car manufacturing at that point was relatively easy to acquire. Japan was able to build strong auto manufacturers and took significant market share when consumer dissatisfaction with U.S.-built cars emerged beginning in the 1970s. However, it is critical to distinguish between catch-up growth and entrepreneurial innovationism. An economy that relies primarily upon catch-up growth will ultimately “hit the wall” in terms of the pace of growth. Hubbard and Kane argue that is indeed what’s occurred within the Japanese economy. They note: “The Japanese catch-up economic model relied on coercive and centralized (government) management of industry, export manipulation, and heavy infrastructure investments. The large Japanese firms that emerged excelled in marginal innovation through research and development. Why was pioneering innovation lacking? Hubbard and Kane point out the existence of a strong aversion to disruption of the existing status quo order within the Japanese culture. Deviation and non-conformism are not encouraged. Such an environment is not favorable to technological progress. ”“Technological conservatism produces an economic inertia that seems an apt description of the history of most societies that ever existed. The pervasive influence of the status quo, tradition, custom, routine, and adherence to precedent were powerful obstacles to innovation and advances. When technological progress occurred, it did so in the face of considerable odds. Middling economic growth has been the trend in much of Europe for so long that it has its own name—Euro-sclerosis. Helicopter government policies have long been active in Eurozone (EZ) countries. This past spring’s Brexit was in part a rebellion against the EZ helicopter parenting.